2K and Gearbox Software’s first person shooter, Battleborn, gets a couple of new modes to wreak havoc starting today. Check out the stylish new trailer for the Battleborn’s first Story Operation Attikus and the Thrall Rebellion. The debut Story Operation, Attikus and the Thrall Rebellion, tells the tale Attikus and his fight against the Thrall on the planet Tempest during the third Thrall uprising that was the catalyst for the revolution against Jennerit Empire. The new operation includes new loot like skins, taunts and an opportunity to earn some Faction Commander Packs. Each time you play through the operation you’ll have an opportunity to unlock new lore, titles and skins. Face-Off is a new 5v5 multi-phase competitive mode. Each team will have to hunt down Varelsi, collect their masks and deposit them at the center of the map for points. Just be sure not get murdered by the other team or else they can steal your masks for themselves. Teams can also build MX.Headhunter assassins which are super minions that will patrol the map and ambush your enemies. Face-Off will take place on capture maps Temples, Snowblind, and Outback. Since Battleborn’s launch, Gearbox has been consistently adding new content to their MOBA influenced first-person shooter with free new characters, maps and game balance updates. The fun noir-styled trailer below shows us what kind of trouble our hero Attikus is going to get into. Anything involving a pair of femme fatales, big payday and a hulking hero has my attention. Face-off is a completely free update for anyone who owns Battleborn. Attikus and the Thrall Rebellion launches today for Battleborn on PC, Playstation 4 and Xbox One as part of the Season Pass for $19.99 or separately for $4.99. 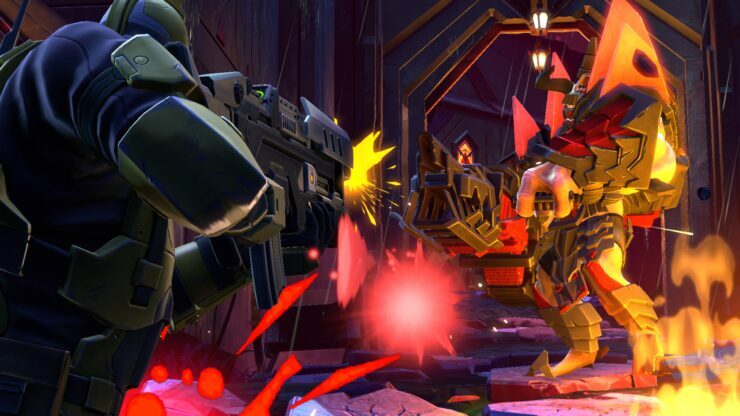 Take a look at our review of Battleborn if you’re curious to see what we thought it.